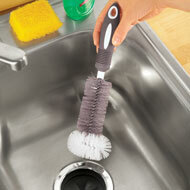 This handy brush makes it easier than ever to clean out your garbage disposal. The unique brush shape is speciallydesigned to clean the walls, blades and other parts of your disposal that are usually difficult to reach. Plastic. 3"Dia. 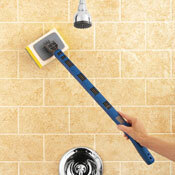 x 12"L.
Now you can clean bathtubs, showers, walls and floors without bending or reaching with this extendable scrubber. Versatile tile scrubber features an extendable handle and a handy swivel head to get into corners and hardtoreach places.  Handle extends from 24" to 36"L. Durable plastic. Sponge is 5 1/2 x 3 3/4". Includes 3 sponges. This easytouse, sonic powered cleaner makes cleaning fast and easy. 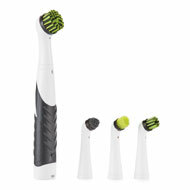 It comes with 4 interchangeable brushes – a soft brush, a small firm brush, a large firm brush and a coneshaped brush so you can easily scrub hard to reach places. 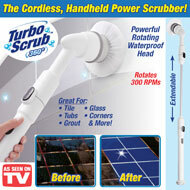 It spins at 8,000 RPM so it's great for deepcleaning grout, corners, stovetops and more! Req. 2 "AA" batteries (sold separately).